Peter Nelson had the most liked content! Nice one Rick. Are you getting them on lake Mac squid? Got up early and quickly loaded up on smilies and yakkas, but as usually I attracted the wind. Rough trip out and back but managed to get a few. 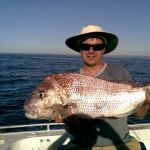 So frustrating trying to get baits past the mutton birds, couldn't even use any plastics. Had a quick flatty drift on the way in an managed 1 and a leather jacket. Something nailed it on the way up on the tail and the next undersize flatty that came up had something fairly big follow it up, couldn't tell what it was but had a blueish/silver look. Can't complain too much as it was better than being at work. Nice one fellas. Looks better than Swansea was this morning, fairly wind at the fad. Are they any good eating? Nice one Baz. I hit Swansea FAD on Monday and managed 10 just legal and there were heaps just under. I've had similar issues with my pickup in the past and trialled an elbow on the bottom of the pipe with the opening facing towards the front of the boat. It worked a treat when driving but just need a tap inline as Rick suggested. All my live squid stayed healthy even right back to the boat ramp. Nice one Baz, good to hear you got out for a fish. I went out today and only managed a few trag, seemed like most people got the same as they were the only fish I saw getting cleaned.👍. Good to hear you got back out on the water Baz. What's the ramp like at the moment, still crowded? Nice catch mate. I hit the lake the other day and only managed a few tailor. 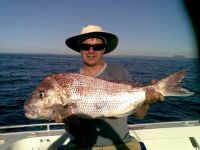 That snapper at the top looks like a good one, how big did it go? I couldn't even clean my fish there, no where to park after pulling the boat in, ha ha. Might park up for a few weeks and do a bit of work on the boat. Hi Baz I normally go into hibernation this time of year but thought I'd give it a go. Like you I think I'll park up for a couple of weeks. I got them in about 55-60m. Good eating too.